Product #16346 | SKU ECM674 | 0.0 (no ratings yet) Thanks for your rating! The Sony ECM-674/9X Shotgun Microphone provides professional level signal reproduction while remaining cost effective. The ECM-674/9X's compact size, audio character and sensitivity result in the level of performance suitable for use with professional and semi-professional video cameras. The ECM-674/9X features a supercardioid polar pattern for excellent directivity and minimal noise at the off-axis sections of the capsule. The result is a detailed, audible signal while used in noisy environments. The microphone provides a wide, flat frequency response which results in smooth, accurate signal reproduction with crisp detail and no added colouration. 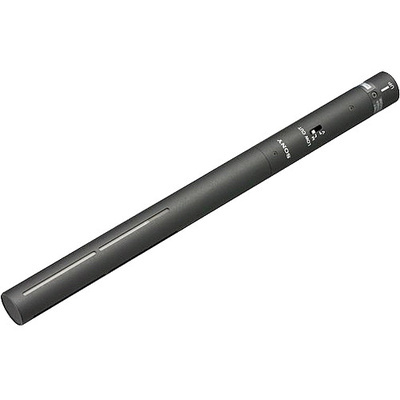 The ECM-674/9X is powered with an internal AA-size battery or external 48-volt phantom power. The ECM-674/9X's size and sound quality make it an excellent choice for event video shoots, film, documentary shooting, court room depositions, etc. The ECM-674/9X is capable of powering via AA size internal battery or external 48 Volt phantom power. The supercardioid polar pattern is effective in minimising noise and ambient audio at the off-axis sections of the microphone capsule. The 2-position low frequency roll-off switch minimises low frequency rumble and noise due to wind, proximity effect, ambiance, etc. The ECM-674/9X features a low-profile and light weight construction. The compact design is suitable for mounting on smaller cameras without obstructing the view.